We set up artificial boundaries for our clothes--work clothes, play clothes, dress clothes. Allow them to stray back and forth, & you'll find you have twice as many outfits. Your summer skirts can actually be worn almost year round. Just pair them with sweaters, much like the Garnet Hill outfit pictured here (add tights if needed). Loverly mix of heavy & light, puts more of your wardrobe into action throughout more of the year. 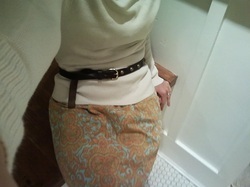 <=I even wore a casual apres-swim skirt to work with a dressy sweater last week--got tons of compliments! No one guessed it was a summer play skirt. 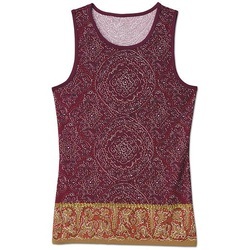 Try wearing your athletic wear or yoga top as a daily top. Throw on a cardigan. 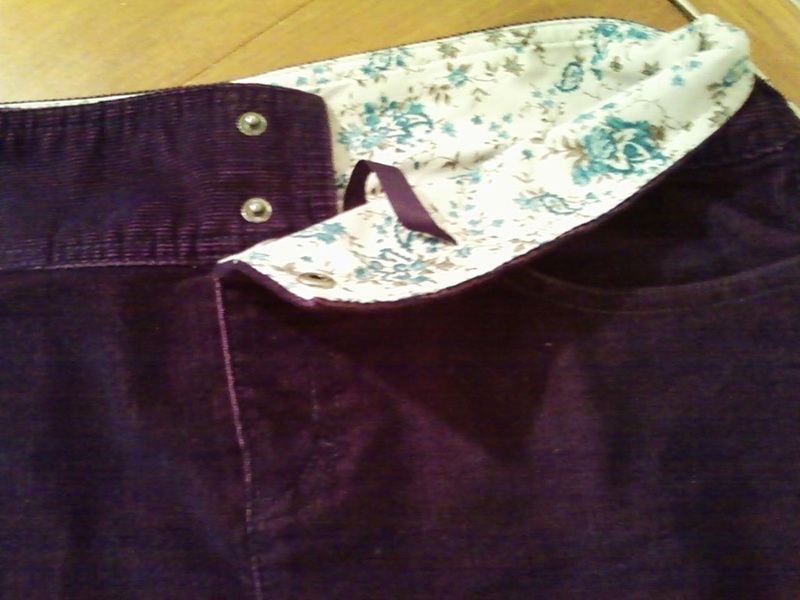 Look at the lining of your jacket, skirt, or pants to find a new print or color combination to match with an old top. Banana Republic top matching liner of dark blue Victoria's Secret pants. Piperlime snakeskin belt. "I love bringing clothing items out of retirement and back into circulation. I have an old old dress I took out and belted today--received complement from my hubby and a young bookstore clerk--think the update was all in the belt." To tie your belt in this fun, casual style, buy the belt in a larger size than you need and then have a shoe repair shop add a hole for you (costs about $1); loop the excess. 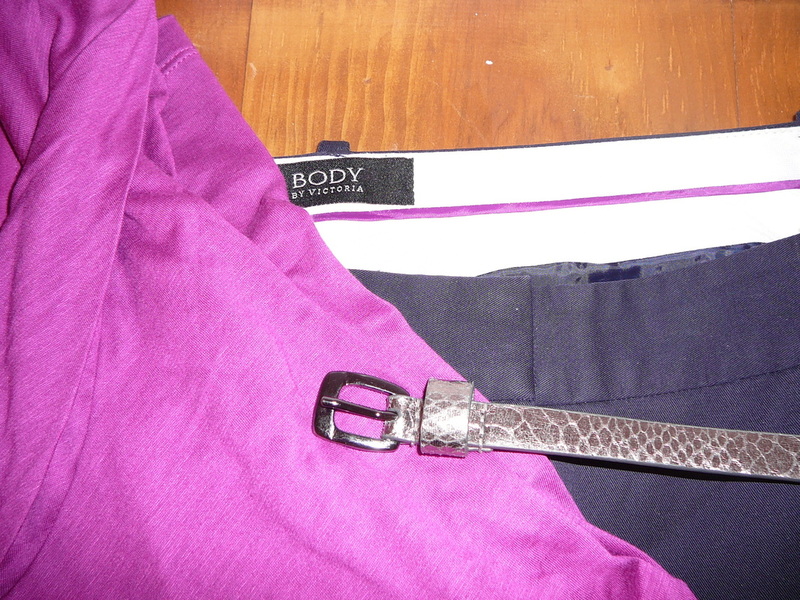 Also try replacing the tie on your wrap sweater with a belt tied in this casual loop. Looks a little more put together, gets rid of the bathrobe feel of a long wrap. If you've been struggling for more than a couple months to wear a specific item, try changing its role. 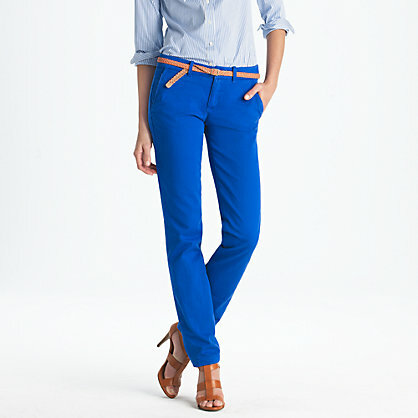 --Pair a casual shirt with dress pants for work or a dressy shirt with jeans for play. --Try wearing a failed shirt as a base layer instead of the main act. --Demote a top that doesn't feel right at work to loungewear. It'll give the item new life and may even help you figure out how to pair it for its original purpose. 1. I have a fairly fancy sheer wrap that I just demoted to everyday use. I had to dig it out of a suit bag where it waited next to a special occasion dress. Feels great to wear it at last! 2. I have a cross-front top that always felt a little too low cut, didn't feel right even with a cami. 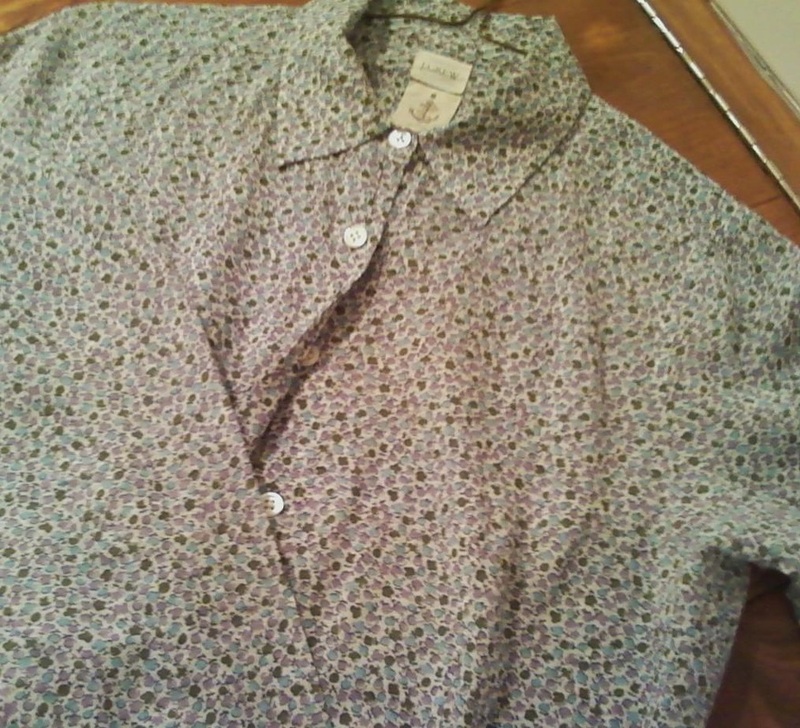 I switched it to a base layer, threw on a cardigan, and now I wear it all the time. The same top or dress that won't work might work out just fine if you turn it back-to-front (and cut off the tag). 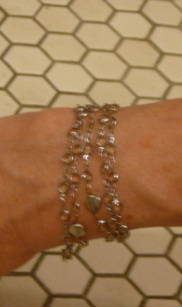 Here's a look that will bring new life to your old jewelry. 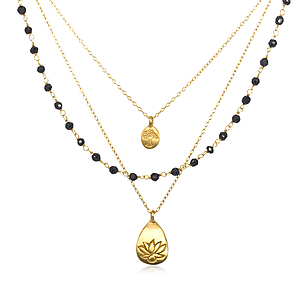 Wear one of your long necklaces as a bracelet. Layer more than one necklace for even more bling. Some wrap bracelets also make excellent necklaces! Tie a knot in your old necklaces, ribbons, and leather cords to create a new look. 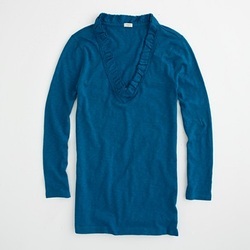 Try a light pullover or t-shirt over a dress. 2. Find a light sweater or t-shirt—in a neutral or matching color—to wear over it. 3. You may want to add a belt. Don't put that fancy dress away! Try layering different shades of the same color. 1. Start with colored tights or hose. 3. Add a top of a lighter shade of the same color. I love this interview with Vera Wang in USA Weekend on how to layer your clothes http://www.usaweekend.com/apps/pbcs.dll/article?AID=2012302030006 . 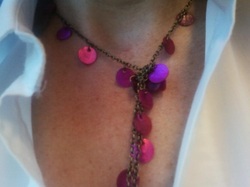 Layer necklaces too--each one takes a supporting role and becomes less of the lead character. Throw a t-shirt on under a tunic, and suddenly the tunic looks natural and less dramatic.